RM Williams, the Outback Outfitter, is the quintessential Australian company. Established in 1932 by Reginald Murray ‘RM’ Williams, it has grown over the years into a great antipodean cultural icon, symbolizing the spirit of the outback. Countless generations of Australians have fallen for the brand’s premium products, and the company still hand craft their world-renowned boots in their Adelaide factory. So how has such an archetypal Australian company ended up such a recognizable global brand? To put it quite simply, the company outshone all other competitors! When RM first learnt his leather-working skills from a horseman named Dollar Mick over eighty years ago, the boots he created served simple needs. They needed to be comfortable, practical and durable for the Bushmen who wore them in the unforgiving outback environment. However, RM’s boots were unique because, unlike footwear made by other leather-workers of the time, his shoes were made from a single piece of leather that was joined together at the back. This not only made the boots highly weatherproof and strong, but also eliminated the raised side seams that could rub or chafe the foot. Word of these boots spread across Australia to far-flung outback stations, and the company soon grew to incorporate, among other products, the company’s trademark moleskins, jeans and bush shirts. 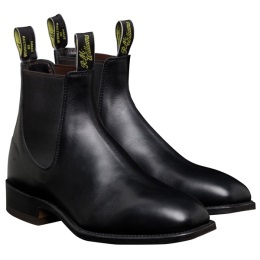 However R M Williams are still best known for their signature hand crafted, elastic sided boots – RM’s to those in the know! With men and women’s styles available, these boots are suitable for all occasions, and are handcrafted using the same processes first conceived of by RM over 80 years ago. For example over 70 hand processes are used to transform premium grade yearling leather into a pair of the sturdy Comfort Craftsman boots – a process that takes over a week for each pair. Generations of travellers visiting Australia have been won over by the classic, practical styling of this footwear, and have brought the brand back to the UK on their return. Demand for RM Williams products has now grown so large that travellers to Australia no longer need to smuggle back Stockyard boots and Moleskin jeans for their friends and family. The company has over 900 stockists worldwide (of which we at Philip Morris & Son are proud to be included!) and the longhorn insignia can be seen on celebs, sports stars, politicians and Bushmen alike. Bill Clinton was even inaugurated wearing a pair of his RM’s! These items are so timeless that they defy all fashionable whims, and can be worn season after season thanks to their practicality, robustness and elegance. clothing, Comfort Craftsman Boots, country clothes, Country Clothing, department store, R M Williams clothing, RM Williams, Stockyard Boots. Bookmark.